Hazardous Waste Compliance concentrates on government regulations as they relate to hazardous waste and other hazardous materials. The main focus of this book is on how to comply with these requirements as well as on other best management practices (BMP), which will ensure worker safety and business protection from the risk of the commercial penalties associated with regulations breaches. The authors provide the reader with useful techniques to enhance worker protection and promote efficiency, productivity and cost effectiveness, along with achieving the necessary quality standards for the work being performed. 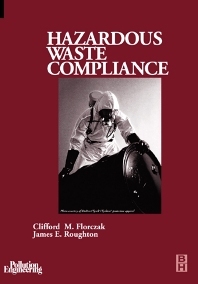 The authors further outline and define methods to help reduce worker injury and illness, the scope and application of HAZWOPER, and ways to implement hazardous material related requirements through enhancements of existing programs. In addition, detailed discussion helps to provide methods to help promote consistency in health and safety program development for handling hazardous materials, encourage a high standard for health and safety, and share lessons learned to help provide approaches that have been implemented on hazardous waste and other sites. Cliff Florczak has spent twenty years in the environmental, safety, and health-related field. He has worked as a contractor performing environmental work for the US Environmental Protection Agency, teaching in the public school system, in private industry including manufacturers of both steel and chemicals, and is currently employed in the environmental consulting industry with a specialization in safety and health. Mr. Florczak has also written and co-authored numerous articles.